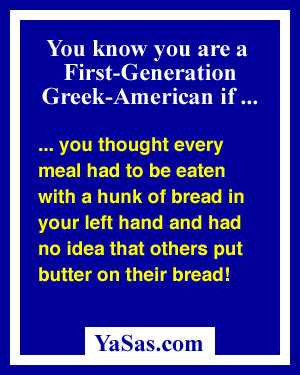 If you were offended by the movie "My Big Fat Greek Wedding" then this page of Greek American jokes and humor is not for you. 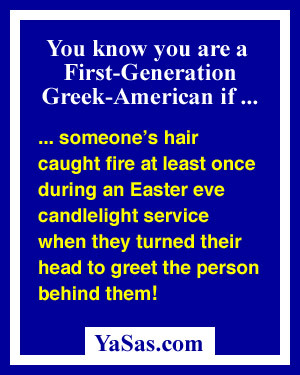 If, on the other hand, you sat in a crowded theatre and noticed that there were two waves of laughter for each joke; one before the punch line from those of us raised as First-Generation Greek-Americans (we knew what was coming next and laughed in anticipation); and the second after the punch line from everyone else, you will most likely get a laugh or two here. You have at least one relative who wore a black dress every day for an entire year after a funeral...or their entire life! You ate peaches and yogurt long before "fruit at the bottom" became popular. 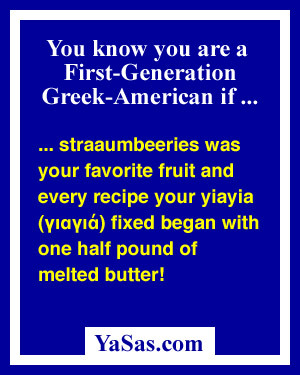 "Straaumbeeries" was your favorite fruit. Your family dog understood Greek. You were surprised to discover the FDA recommends you eat three meals day, not seven. You thought killing the lamb each year and having feta, tsatsiki and olives on your dinner table was absolutely normal. You were teased by your classmates for bring Easter eggs to school a month after Easter. Aren't they rotten yet? You thought everyone's last name ended in a "is". Your mom's main hobby is cleaning. You thought Orthodoxy was the only religion in the world. Your grandmother never threw anything away. You thought seeing washed plastic bags hanging on the clothes line was normal. 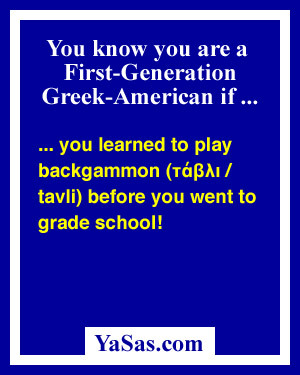 You learned to play backgammon before you went to school. You have at least one relative who came over "on the boat" from "the old country." You have at least six male relatives named Nick, John, Peter or Kosta. You have relatives who aren't really your relatives. There was an icon in every room of the house, including the bathroom.